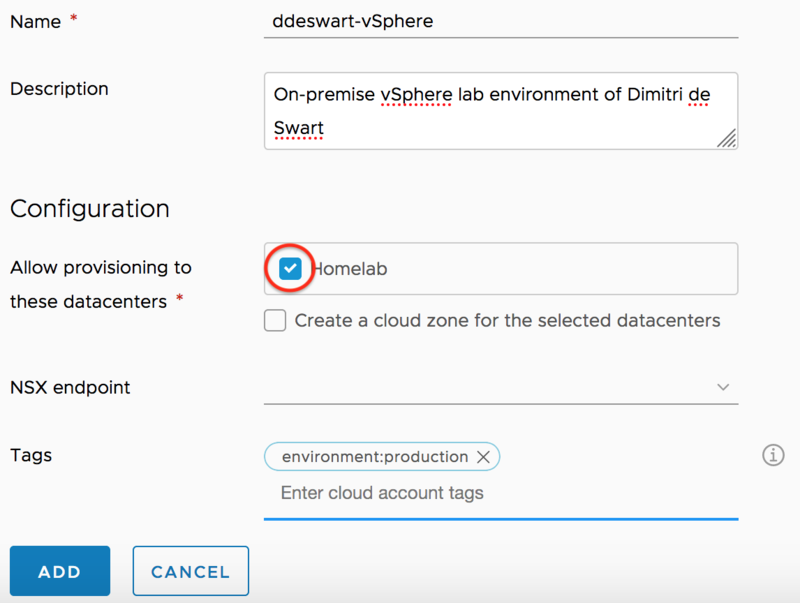 To connect your on-premises vSphere environment with Cloud Assembly, you have to deploy a Data Collector. 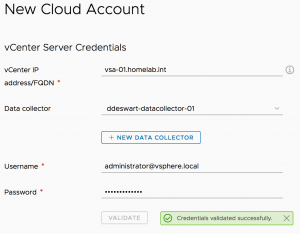 This Data Collector discovers all kinds of information about your environment and makes it possible for Cloud Assembly to interact with components in your environment such as vCenter, vRealize Orchestrator, Puppet Enterprise etc. etc. 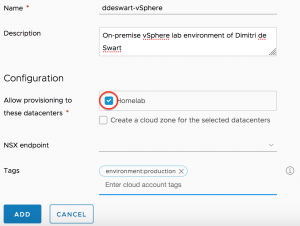 In this first post of our new Cloud Automation blog series I will walk you through how to deploy the Data Collector and do a basic setup of a vSphere Cloud Account in Cloud Assembly. 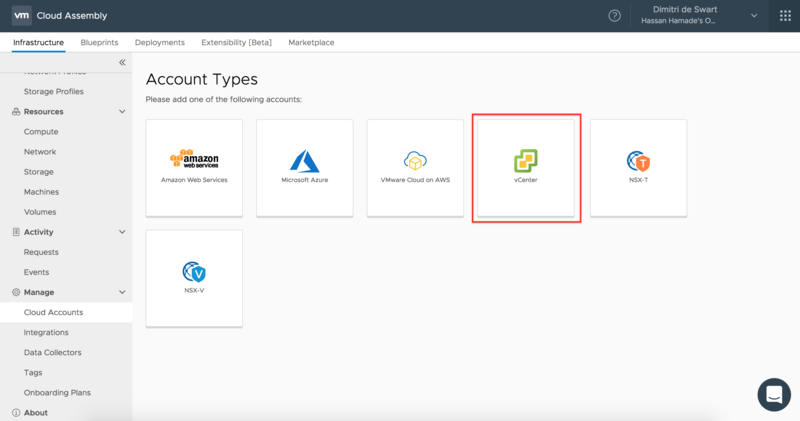 Login to VMware Cloud Console using your VMware Cloud (Automation) Services account. Go to My Services and select Cloud Assembly. Click on the Infrastructure/Manage tab, scroll down and select Data Collectors. Click Add New. Download the Data Collector .ova file and copy the provided token key. 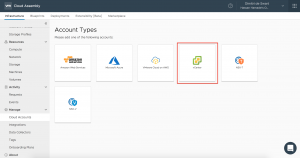 Login to vCenter Server, right-click on a cluster and select Deploy OVF template. Click Select template, then Local file. Choose your downloaded Data Collector .ova file and click Next. 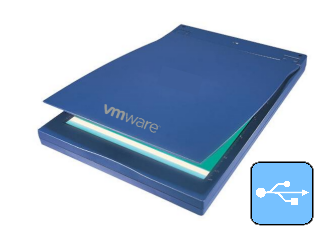 Enter the name of Data Collector VM and select the folder where you want to place the Data Collector in. Click Next. Select the cluster where you want to run the Data Collector and then click Next. 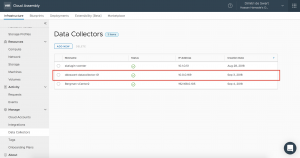 Review the details of your Data Collector deployment. Click Next. 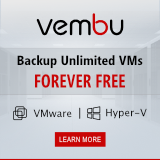 Select your your Virtual disk format and Storage policy. Then select a datastore from the list that has enough free space for the .ova file. Click Next. Select a Destination network and IP protocol. Click Next. Enter the required information. Do not click Next yet. For Display name of the Remote Data Collector, enter the name of your Data Collector VM used in step b. For Root User Password, choose a unique password. It does not need to match the vCenter password. Paste the token key you copied from the Data Collector form in step 4. If you use a Network Proxy to connect to the internet, the you must provide this information. If you use DHCP in your vCenter network, do not enter any information. If you do not use DHCP, then you must provide information for each setting. Click Next. Review your configuration data. Click Finish. When the Data Collector OVA is successfully deployed, start the Data Collector. To verify that your Data Collector is running, look under the VMs tab at the list of your virtual machines to ensure it is Powered On. Return to Cloud Assembly, click Next in the Data Collector form. Wait a couple of minutes for the Data Collector to appear. 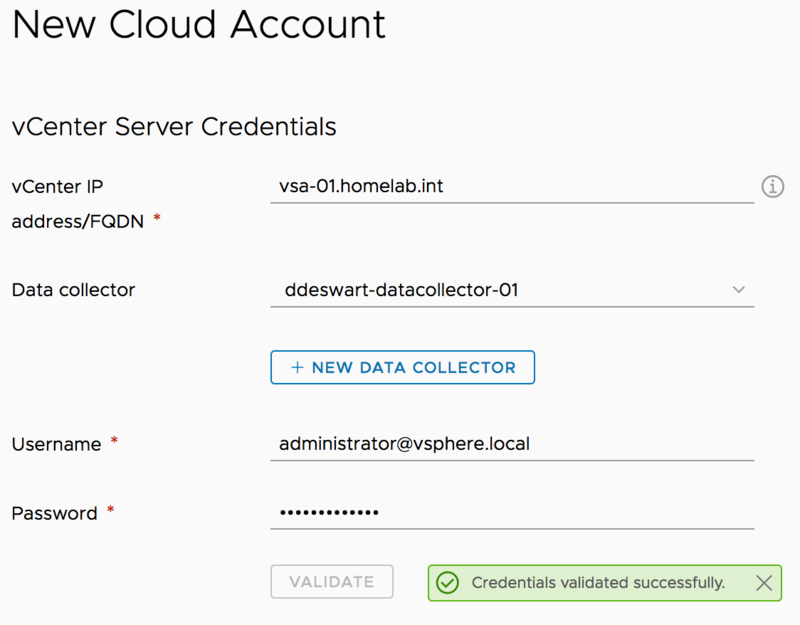 If the status of the Data Collector is green you’re ready to setup a vSphere Cloud Account. 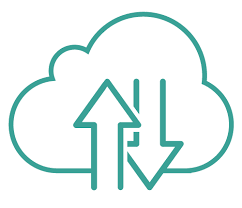 A Cloud Account identifies a cloud account type and an account-specific deployment region or data center where the associated cloud account resources are hosted. The Cloud Accounts in your project are based on vendor type and data center or vCenter residency. As you define profiles and mappings, you specify data in relation to a specific cloud account/region in your project. In Cloud Assembly under the Infrastructure/Manage tab select Cloud Accounts. Click Add Cloud Account. 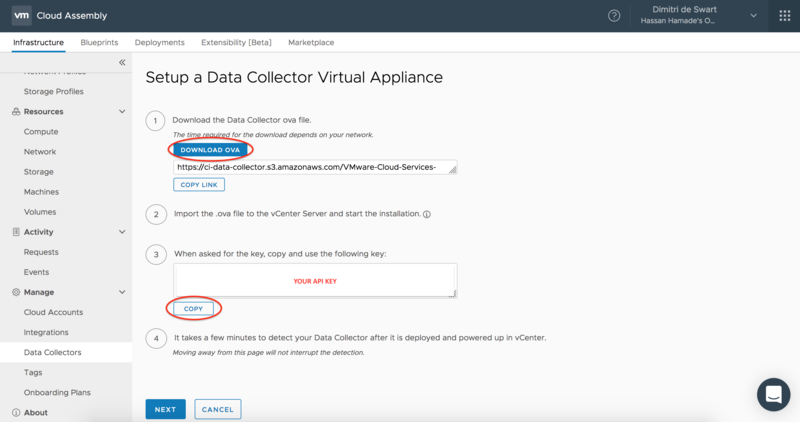 Enter you vCenter Server credentials and select your Data Collector. Click Validate. Enter a name for this Cloud Account. Under Configuration select your datacenter(s) which you want to provision to. 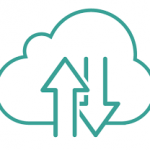 If you want to setup a Cloud Zone manually, do not select Create a cloud zone for the selected datacenters. Optionally, add a (existing) tag. For example, environment:production. 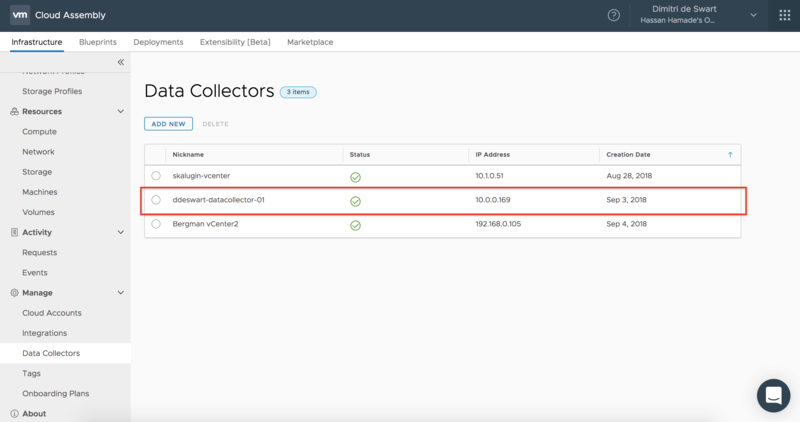 Wait a couple of minutes for the Data Collector to collect all kinds of information about your vSphere Cloud Account such as clusters, resource pools, networks and datastores. You can verify this under the Infrastructure/Resources tab by selecting Compute, Networks and Storage. In my next post I will show you how to setup a Cloud Zone for vSphere including Flavor- and Image Mappings, Storage- and Network Profiles.